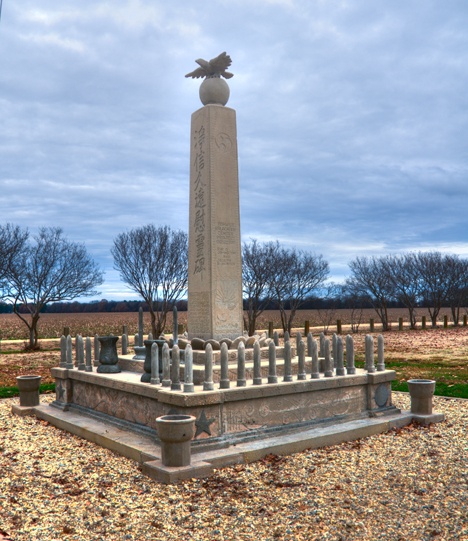 This is the front view of the “tank” memorial at the Rohwer War Relocation Center Cemetery, a national historic landmark. The masonry edifice was created to remember fallen members of the 442 Regimental Combat Team who were residents of the Rohwer War Relocation Center. In 1942, the tiny Arkansas towns of Jerome and Rowher in southeast Arkansas zoomed from close to the bottom of the state population list to number four and five. Jerome, at 142, added 8,497 residents, while Rohwer at 102, added 8,475. None of the new residents voluntarily abandoned their California residences to become denizens of LA (lower Arkansas). Before we traipse forward with this story, check out the where the story started on the Photo of the Week page at Corndancer dot-com where you will find more pictures and info on the heroes of the 442nd Regimental Combat Team. These non-volunteers were to the person, of Japanese descent. They were subject to Executive Order No. 9066 issued by President Franklin D. Roosevelt in the aftermath of the Japanese attack on Pearl Harbor December 7, 1941. Without going into gory detail, the order mandated that all persons of Japanese descent would sell or give away all of their possessions save a few items of clothing and personal items and be prepared to reside in assembly areas while a number of “War Relocation Centers” in remote, inland locations were being hastily prepared for their arrival. For the most part, there was a lot of self sufficiency in the communities. Support for the non-volunteer communities came from within, since the population included butchers, bakers, cooks, radio repairmen, sign painters, doctors, lawyers, merchants and more, including the artist who painted this view of the guard towers at the Jerome Center. Among other things, the residents were excellent gardeners. 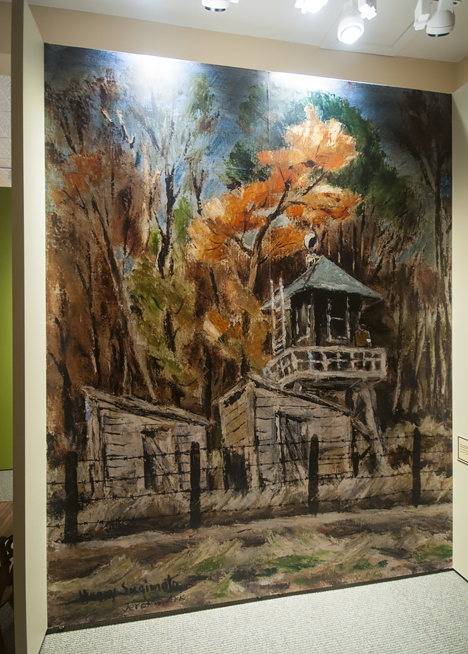 The painting is part and parcel of the collection of relocation memorabilia in the Jerome-Rohwer Relocation Museum and Information Center at McGehee, Arkansas. The assembly areas were cobbled together of everything from quickly constructed shacks and tents, to the smelly horse stalls of the Santa Anita race track. That was bad and things were not going to get much better. 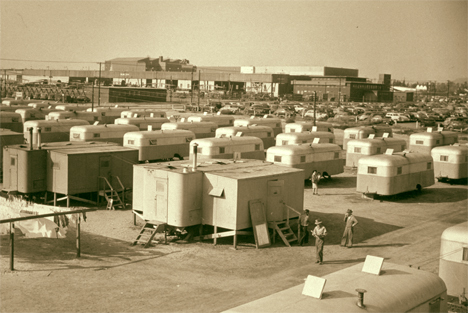 The camps consisted of tar paper covered barracks which held five families, communal bath facilities, a mess hall and other trappings of a small captive community. 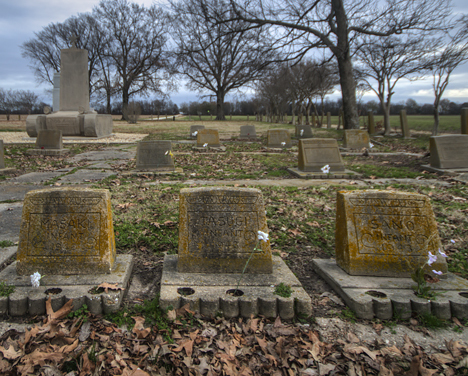 The Rohwer Cemetery includes this masonry memorial erected in 1944 to honor center residents who died during their stay. When the relocation centers were deemed ready for occupancy, these 16,972 new Arkansas residents were loaded on passenger trains bound for LA. The trip would take three days and four nights during which no one was allowed to leave the train. Only one bag per person was permissible for personal items. There was one individual who absolutely refused to be relocated, Mr. Fred T. Korematsu. His protest failed in federal court and he was remanded to federal prison for the duration of the war and two years thereafter. Decades later, supporters pursuing his case uncovered prosecutorial chicanery which contributed to his incarceration. His conviction was overturned. 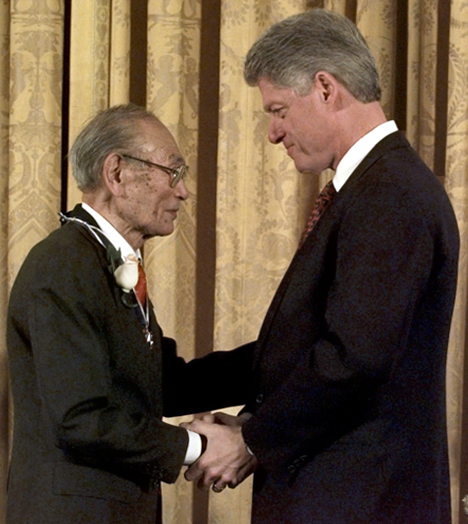 On January 15, 1998, President Bill Clinton presented Mr. Korematsu with the Presidential Medal of Freedom. Despite this cavalier treatment, residents of the Jerome and Rohwer camps became volunteer members of the 442nd Regimental Combat Team. Together with their fellow members of the 5th US Army, they valiantly fought Germans in Italy and France during World War II on behalf of all of us, including those who created and facilitated their ill-conceived relocation. When all the dust settled, the 442nd was the most decorated Unites States Army unit in World War II. 1942 and 1943, above all else, was not a good year for the Masakis, the Tasugis, and the Sanos. They all lost infants. George Takei, better known as Lieutenant Hikaru Sulu on the original Star Trek television series, and his family were detainees at the Rohwer Center. He was active in bringing the Jerome-Rohwer Interpretive Museum and Information Center to fruition. He was a speaker at the dedication. While he was in Arkansas he granted interviews. The video below provides a sample of his observations as a child detainee and how his family was affected. After the defeat of Germany in 1944, United States forces were amassing a sizeable number of German prisoners of war. Some self-appointed genius came up the idea of relocating the Japanese relocatees residing at Jerome and repopulate the facility with German POWs. The pseudo-genius’s leaders bought off on the concept. 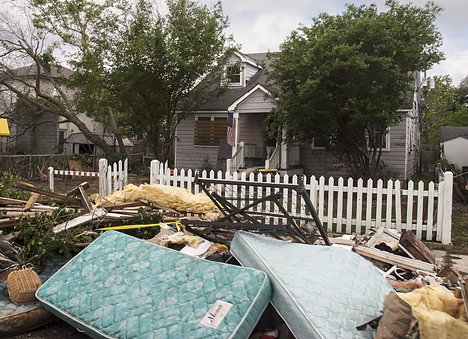 So for the second time, American families were uprooted and moved. 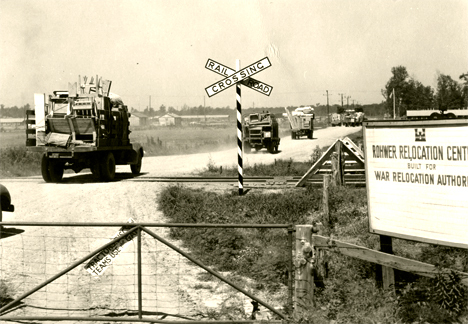 Trucks move detainees property from Jerome to Rohwer after the decision was made to house German POWs at Jerome. The end of these American citizens’ confinement was as ignominious as the inaugural fiasco. Officials gave residents $25 in cash and a bus ticket with the admonition that they could go anywhere. Anywhere that is, except where they were. Since detainees returning to California were returning to nothing, Uncle Sam put up a park populated by small trailers to accommodate returning families with nowhere to go. Historians tell us that some stayed in these until their death. This was known as the Winona Housing project in Burbank, California. This page in American history should have taught us all to do politics like carpenters cut wood: Measure twice. Cut once. The only problem is, getting ‘em to buy into the concept after the ballot boxes have closed. A lone standing tree in an agricultural field has a reason to be there. This one is a memorial. Read our story to find out more. Click on the tree for the details and pictures from the original story. Our Christmas story is a repeating tale. 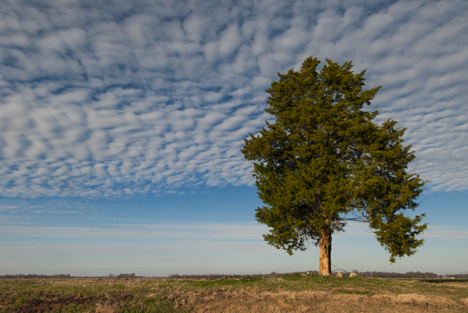 We first encountered the lone cedar tree in the field west of Dumas, Arkansas and figured there was a story behind it. In this case our presumption was bolstered by facts. The story was one of human frailty and subsequent kindness — interrupted by the worst of human predatory behavior. The tree stands as a silent reminder of the story and the lesson of the conclusion. See our original post from December 21, 2008 and our re-write of the original story on the Photo of the Week page at Corndancer dot-com. 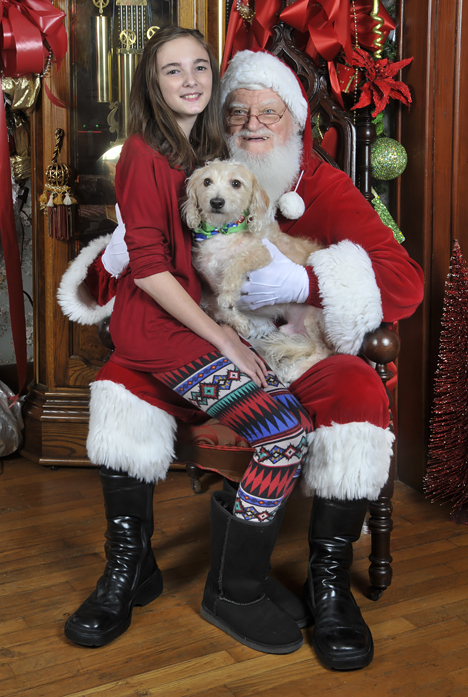 Santa, this young lady, Peyton Madison Dempsey, and one of her dogs, Max, usher in the season on a special day, the 12th anniversary of Madison’s birth. She came into this world a bit early (26 weeks), and tipped the scales at two pounds, four ounces. She handily beat the odds, for which I am eternally grateful. She is my granddaughter. There’s nothing like an encounter with a bunch of dogs who have brought their families with them to a photo shoot with Jolly Old Saint Nick to awaken the seasonal joy of Christmas in one’s person. 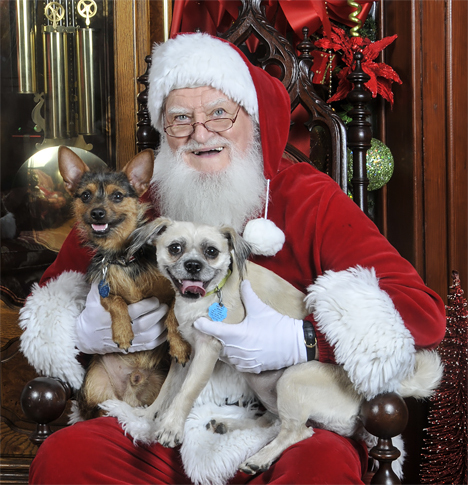 The onslaught of goodness on four feet to which I am referring is the annual Jefferson County Human Society pictures with Santa event. The festivities take place at Margland Bed and Breakfast, a magnificently restored Victorian domicile in Pine Bluff, Arkansas, my fair city. There is no place I know of that is more Christmasy, so it is a perfect setting. The event is a fundraiser for the Jefferson County Humane Society which is 100% dependent on contributions to continue its noble work. 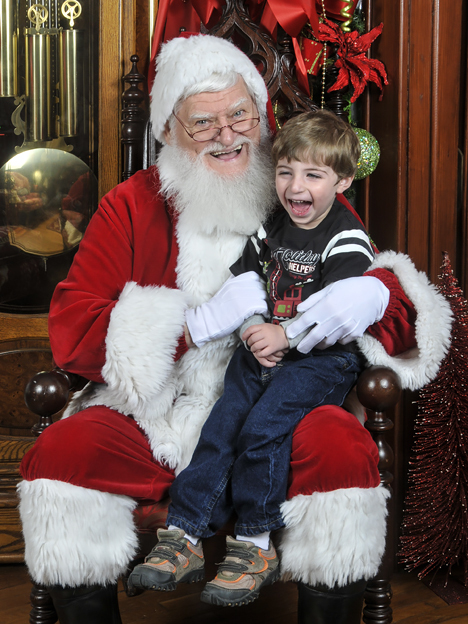 You can see more of this delightful event on the Photo of the Week Page at Corndancer dot-com. We will patiently wait here. 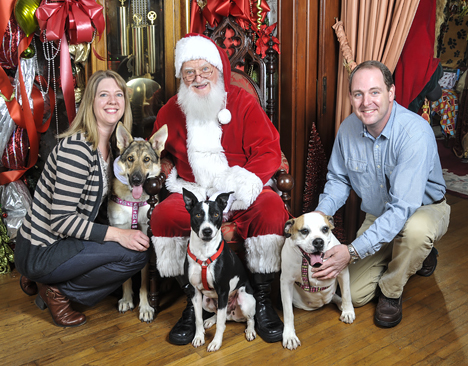 Santa and these two rescue dogs, half of a family of four rescues, seem to understand the meaning of the season. 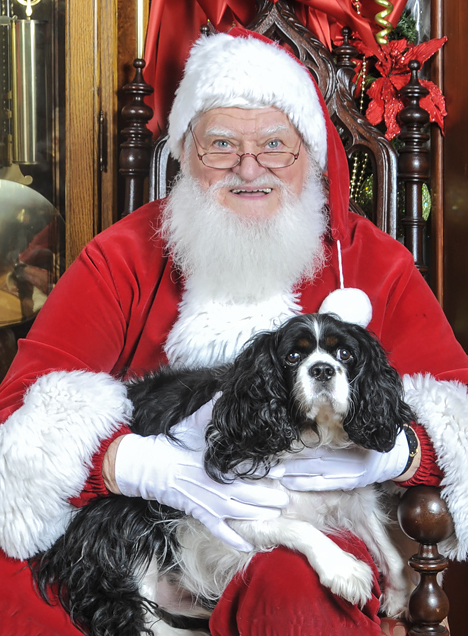 Santa and spaniel. The dog behaved well with no wiggles and a good eye to the camera, a paragon of patience on four feet. 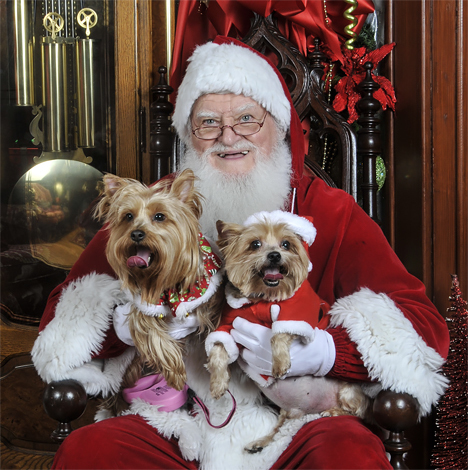 No Christmas dog picture session is complete without a Yorkie or tow decked out for the season. These two accepted that mantle of responsibility with aplomb. One big happy family of three rescues and their humans beam with holiday happiness while they show their stuff with the Jolly Olde Elf. No explanation is needed here. All systems are go! 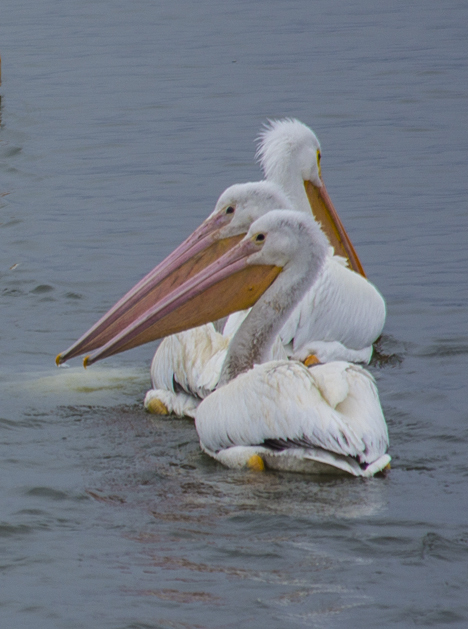 The pelicans in the foreground are telling us and their acquaintance that two is company and three is a crowd. They are enjoying a leisurely winter swim in Saracen Lake at Pine Bluff, Arkansas while most of their human compatriots are hunkered down in mortal fear of cold weather. Here in LA, (lower Arkansas), prognostication of frozen precipitation and lowering temperatures triggers a mass movement of otherwise rational, but now terrified, citizenry to local food stores where they go through the milk and bread sections like hordes of rampaging barbarians. 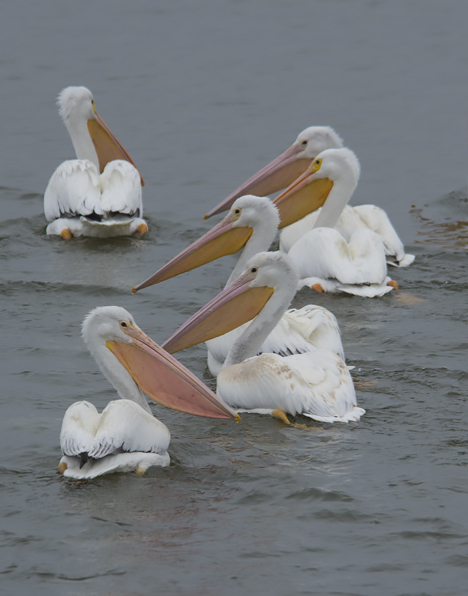 Meanwhile, the pelicans who visit us during winter months, go about their business of being pelicans with little concern about meteorological conditions. They apparently know something we don’t. Click on the big bird to see more pelican pix and the start of the story. I observed this pelican weather disdain recently at Saracen Landing on Saracen Lake here in my fair city of Pine Bluff, Arkansas. They were cavorting around the pavilion which gave me an opportunity to make a surreptitious approach and squeeze a few shots before they went into their predictable evacuation mode. 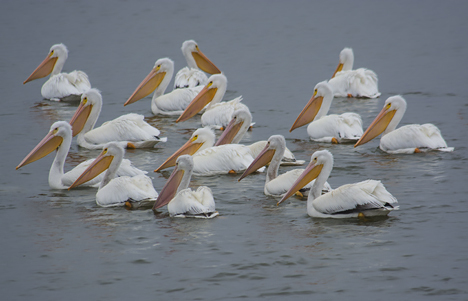 At this point, I am suggesting that you take a short trip to the Photo of the Week Page at Corndancer dot-com and see more pelican pictures and discover the roots of the story. We’ll wait here. These big birds are forming up to do the good-bye swim. Were fortunate to get this close. These pelicans are heeding the legendary Horace Greeley admonition, and heading west. I suspect that in the wake of our recent spate of wintery conditions, sales of milk and bread will plummet since there are now enough privately held inventories to last for the foreseeable future. The pelicans could care less. 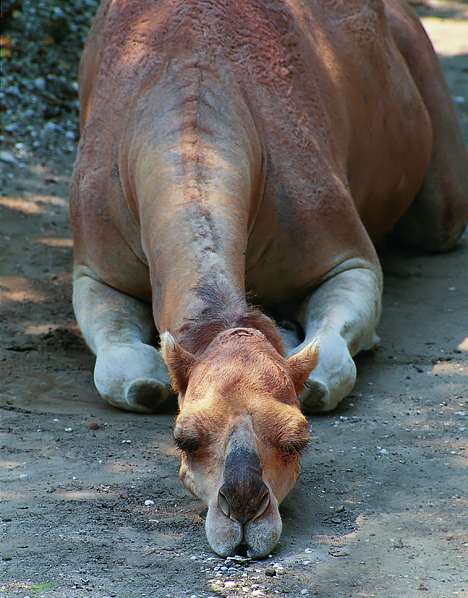 Though I photographed this Audubon Park Zoo camel in New Orleans in the early to mid-nineties (on film), he or she might still be with us since camels live 30-40 years. Katrina, while disastrous to most of the city did not unleash her full fury on the zoo, so survival through that catastrophe shouldn’t have been a problem. It was if he or she was waiting on me. After a roll or so of film, I said thank you and bade farewell. Despite the Katrina’s failure to administer the coup de grâce to New Orleans, the damage, as most will recall, was more than substantial. Even at that level, the scurrilous storm did not cashier the festival. Late in 2005, we received notification that the festival was on. At this point we suggest that you can see other festival and lower Ninth Ward pictures where this story started, on the Photo of the Week page at Corndancer dot-com. Take a good look and we will wait here while you peruse images and verbiage. 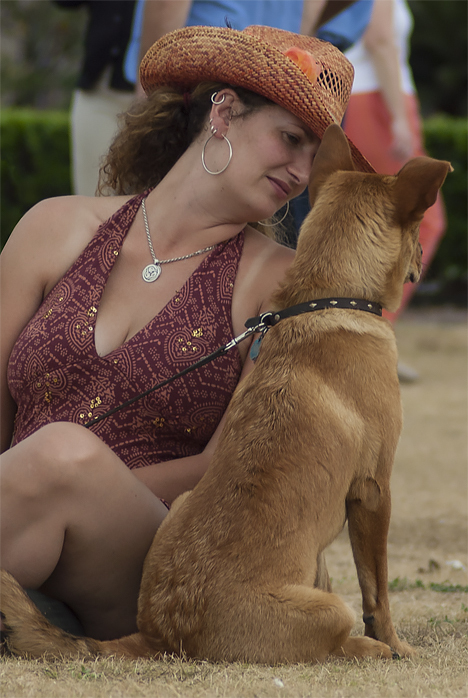 Pretty girls with dogs are as ubiquitous as bands at outdoor concerts, and the 2005 French Quarter Fest was no different. Something caught the dog’s attention which set up a good photo op. Blind hog finds acorn again. We attended the festival April 21 and 22, 2005. Other than damage to trees and a few closed shops in the French Quarter, we did not see much evidence of the evil sister’s visit. 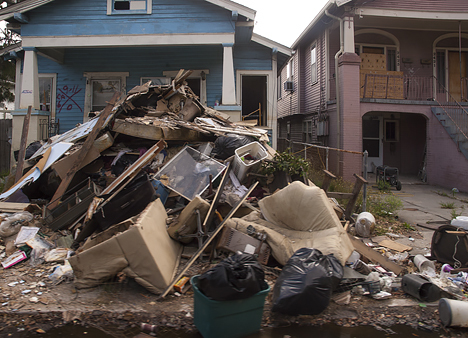 However, even as the party went on in the Quarter, life in the lower Ninth Ward, the area that caught the worst of Katrina’s flooding, fell way short of comfortable. 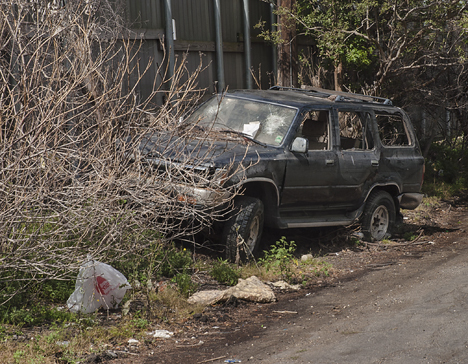 Call it morbid curiosity or whatever you’d like, the first leg of our return trip was one of observation, through the lower Ninth Ward of New Orleans. 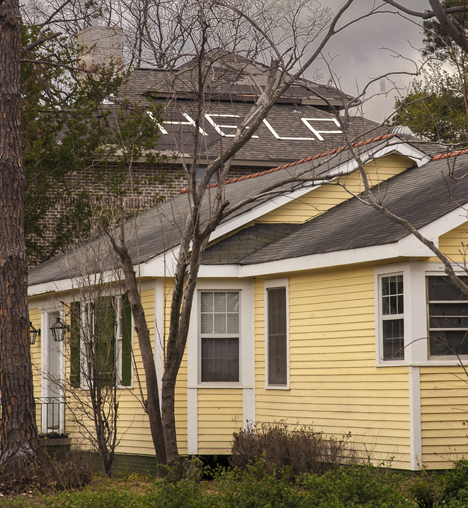 I shot the following pictures on that trip, nine months after Katrina made her fateful visit to south Louisiana. This is the first time these images have been made available for public viewing. Look closely for a man entering the house. The residents here made sure the Coast Guard helicopter crews knew what was needed. These homes have been “inspected.” Note the cryptic spray paint code on next to the door. 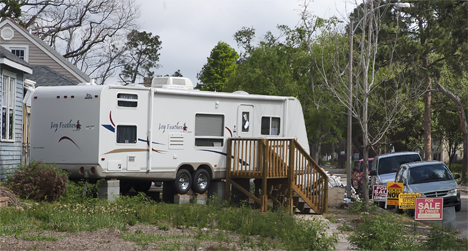 There were a number of camper trailers set up in residential yards. Just around the corner from the camper this abandoned suffers callous neglect. While to some, considering the reveling of the festival and the misery of the lower Ninth Ward in the same article may seem calloused, the truth is, the city needed all of the merry-making it could handle to pump good Yankee dollars into the seriously injured Crescent City economy. The condition was and still is called reality.